Online bookmaker https://www.netbet.co.uk is determined that Twickenham will be at its loudest this Saturday with England's Rugby World Cup future on the line against Australia on Twickenham and will be doing all they can to raise the noise levels! Tests during this year's Six Nations Championship showed that the Millennium Stadium in Cardiff was by far the loudest ground in the competition with Twickenham trailing behind in third, behind the Aviva Stadium in Dublin. 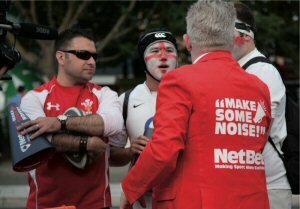 A Netbet spokesman said: "It is on public record that the highest average decibel level for a ground during the Six Nations Championship was 92dB at the Millennium Stadium in February for the Wales versus England clash. 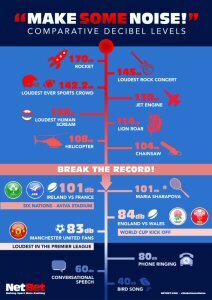 The highest level reached at any time during the Six Nations was 101dB with the roar at full time when Ireland beat France at the Aviva on 14th February." "We were surprised that our reading just before kick-off from the England versus Wales match at Twickenham last Saturday was just 84dB, it seemed a lot louder than that but we are determined to help the fans pump up the volume and make some noise!" The Netbet bus with girls handing out megaphones will be around Twickenham ahead of the crunch battle with the Wallabies on Saturday and they have their own Master of Ceremonies in Greg Scott, who will be firing the fans up and making sure they are in good voice before they enter the ground. "Manchester United fans at Old Trafford typically measure 83dB and we think it will be easy to break this figure. Our aim is to break the rugby union record of 101dB set at full time of the Ireland v France match during the Six Nations", added the Netbet spokesman. 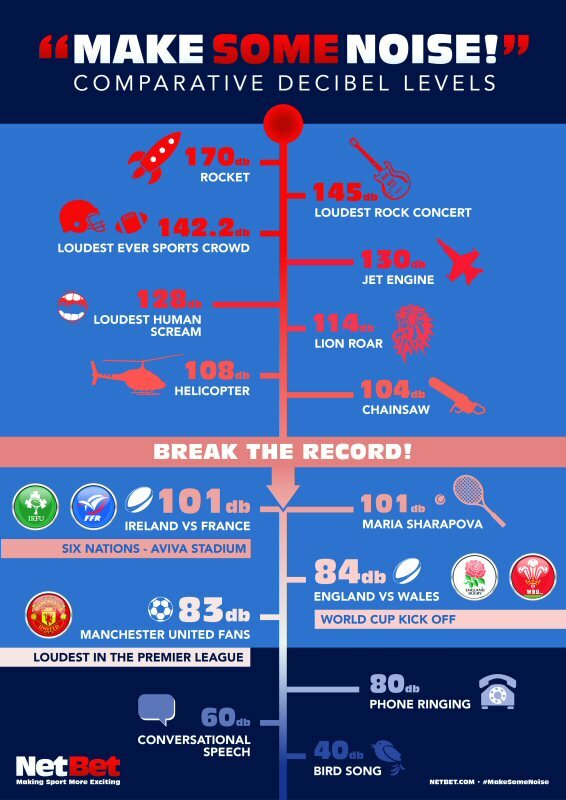 "A lion's roar is typically registered at 114dB - the noise of up to 82,000 lions in the Twickenham cauldron should get the decibels into three figures." You can keep up with how efforts are going on Saturday by checking out the latest news on twitter @netbet. NetBet are an established brand in regulated European markets including The UK, France, Italy, Spain, Ireland, Belgium and Romania. The company offers Sports-Betting, online Casino, and Poker to its customers. The company is the official betting partner of West Bromwich Albion for the 2015 - 16 season, they also sponsor St Etienne and Ajaccio in France. Rugby fans are encouraged to make some noise outside Twickenham by Netbet Master of Ceremonies Greg Scott.